I'm going to use my Cosmo Cricket Early Bird dp for all of the cards. I think it's fun to make little sets like this every now and then. For my first card I used probably my favorite Verve set Miracles Blossom. I stamped the stems of the flowers with Kiwi Kiss and the tulips with Real Red. I didn't have any red rhinestones or pearls, so I colored in some white pearls with a red Copic marker to put on the butterflies. My next card uses the Up, Up, & Away set. 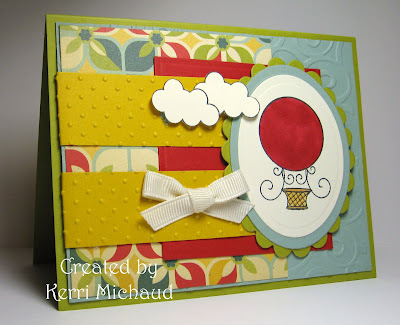 I love these whimsical hot air balloons! I stamped the balloon with Memento Tuxedo Black and colored with Copics. I added some texture with my D'vine Swirls and Swiss Dots CB Folders. 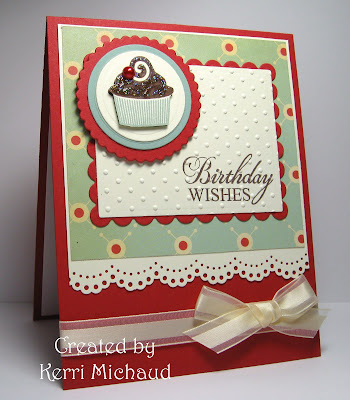 My third card uses a cupcake from Verve's Cupcake Affair. I stamped the frosting with Chocolate Chip and the bottom with Sage Shadow twice and cut one out so I could pop it up. I added Stardust Stickles to the frosting, and once again colored a white pearl with a red Copic for the cherry. The sentiment comes from Verve's Wishful Elegance set. Well, I'm off to start on card #4! Thank you so much for stopping by today! Oh my girl these are all soo beautiful!! I love how you did the tulips on the first one and how your papers just matches everything so perfectly..Lovin those clouds and hot air balloon too...OOO and I can't forget that yummy choc cupcake...Beautiful work! These are some stunners, Kerri! I really want that balloon set and one day I'll get it! Kerri...These are just LOVELY! Bright and and full of cheer! 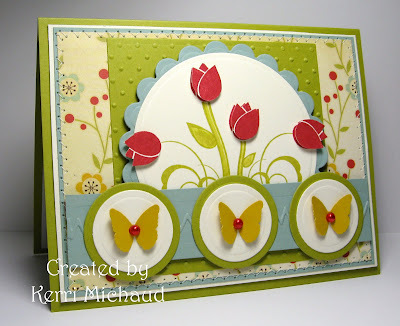 Kerri, these cards are so elegant and stunning! You are doing an amazing job with Verve stamps! Kerri ~ You are too much! I love all of your images and what you have done to create around them...As always you are the best! Cosmo Cricket and tulips - - 2 of my most favorite things ever. That last card...with the sentiment on the Swiss Dots...I assume you stamp it first them run it through the embossing folder? Never done that before..
You are cranking out the cards! I actually printed off the sketches of all 5 of these, and haven't done one yet! These are fantastic. I love the little pearls that you colored red....great idea. These are all so springy and cute! Great job on all the sketches! Wow Kerri! I love all three of these cards! Of course, Cosmo Cricket is always one of my favorites. I love it so much, I have a hard time cutting it up! Great work! Hi Kerri! I'm not surprised at all how gorgeous all 3 turned out, but I have to say WOW! You really outdid yourself this time, and I'm so, so glad I found your blog and visit often, because your creations are so inspirational! ...are you still working on card #4?